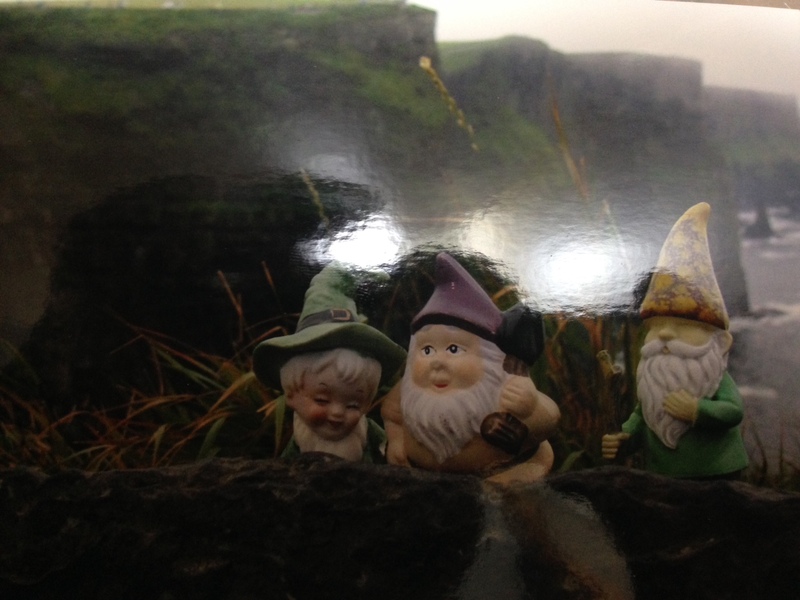 I’ve never been to Ireland but my gnome has. And I guess the worst part of it is that I didn’t even know he was gone. He was one of those little dudes in your life that you tend to take for granted, I guess, until he comes back to you. You see he tarries in the garden, where any self-respecting gnome ought to, and no, he doesn’t have a name. 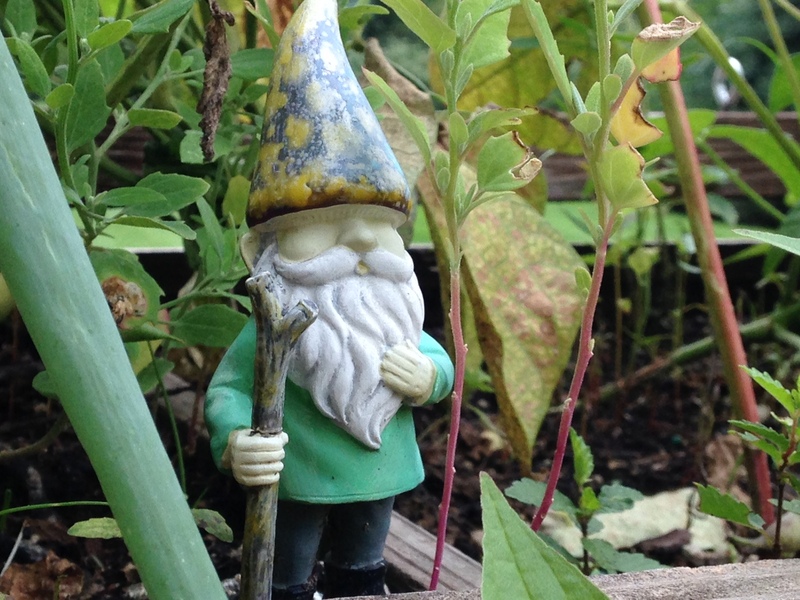 I’m not much of a gnome fellow, and I do not see what my wife sees in him, but none-the-less, he stands stalwart among the bean plants, like a gate-keeper to the greens. She picked him up on one of her many errands to the garden center, and nary ever bothered in turn to tell me why. Either you get gnomes or you don’t, I guess. Kind of like Neil Diamond. But I suppose he’s cute enough, by and by. And I’m talking about the gnome, thank you kindly. Well one day not too long ago, and unbeknownst to us, he was covertly and flagrantly gnome-napped. Taken hostage by two friends of the female variety, who stowed the little fellow into their travel satchel of assorted womanly sundries, and henceforth made way over the big pond in an aeroplane for Ireland. 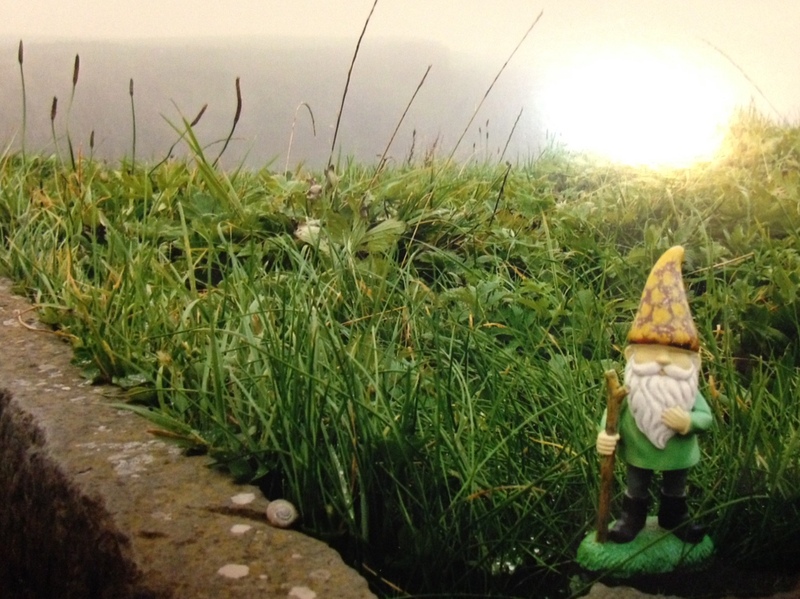 For ten days, our little gnome parlayed for mercy at the hands of his abductors, and for ten days he was forced to pose for photos in front of a variety of Irish land marks. I did not know whether to be happy or sad for him, this mostly, again, because I didn’t even know he was gone. But he was. And that’s the great patheticness of it all. Here is a photo of him let out to pee by the Irish Sea. And here is one of him bandied together with like-minded drinking buddies or the kin. I think they were making a break for it and were caught again by the female captures. Their faces say it all. I digress. This post was supposed to be about the art of grilling supper, and some how you got me going on gnomes. It’s just that whilst I was loitering by the pit here, the little gnome has done the very same in the pit-side garden. Him and I hang out like this a lot, don’t you know. Just watching the smoke curl into a beautiful Minnesota sky. Leastwise we do these days. Now that his ransom has been won, and he has thus been returned to my garden plot with his spoils intact. I don’t take him for granted as much as I once did. Anyways, about supper. Take a gander at these thick cut chops! For seasoning tonight, we went fairly simple. Salt, pepper, and garlic powder. That’s it. If it’s good pig, that’s all you need most days. 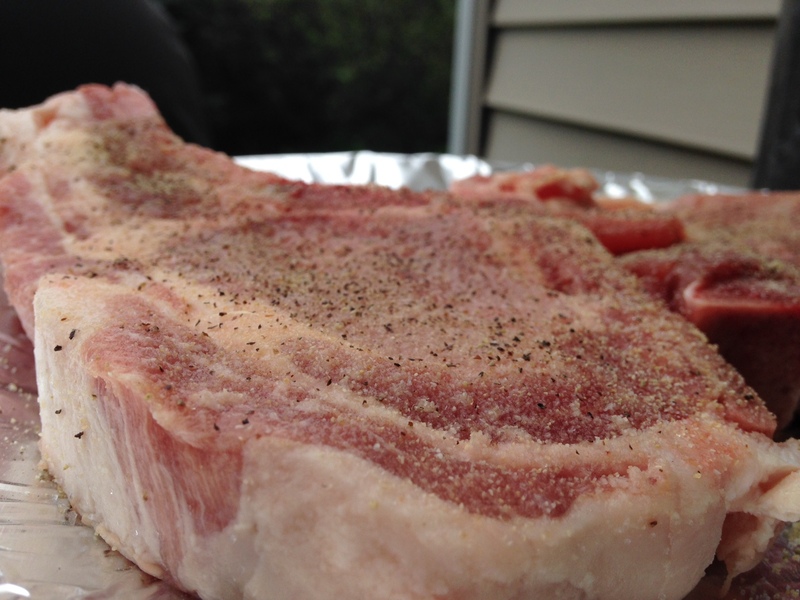 For ninety seconds, we placed the chops over direct heat, to sear in the juices there. Then we flipped them for ninety seconds more on the other side. Gray clouds idles overhead. A Great Blue Heron swoops past the scene, it’s massive wings fanning through the summer air. 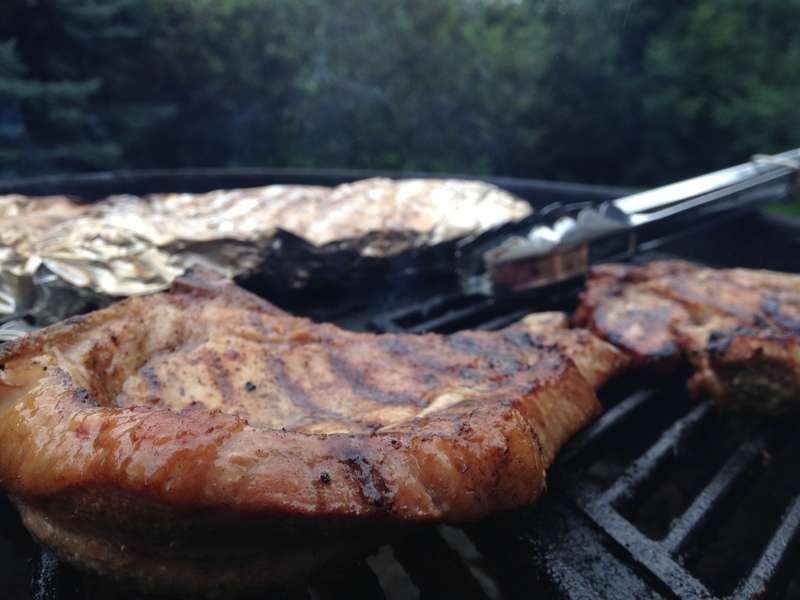 The pork chops sizzle sensuously on the hot cast iron grate. If smells were music, then the heady aromas bantering about the pit were like a lovely dollops of Beethoven up your nose. Glory! We then tossed a chunk of hickory wood on the fire, and thus escorted the chops over to indirect heat, opposite the hot coals. And there they would ride the remainder of the path unto a hickory-tinted, highly edible succulence. And it didn’t take long either. We also prepped up some tin foil potatoes, one of our very favorite sides for the grill. Two potatoes and one onion, diced to uniformity, and seasoned in salt and pepper, along with a few globs of butter to keep things sporty whence foiled over direct heat. Tin foil potatoes are an easy victory, people. Twenty minutes or so over direct heat, flipping once at your pit master instincts. They are the perfect side to compliment any meat patron to the pit. Yum! It is likely our civic duty to gnomes, and to lovers of gnomes, to post these mug shots in kind. 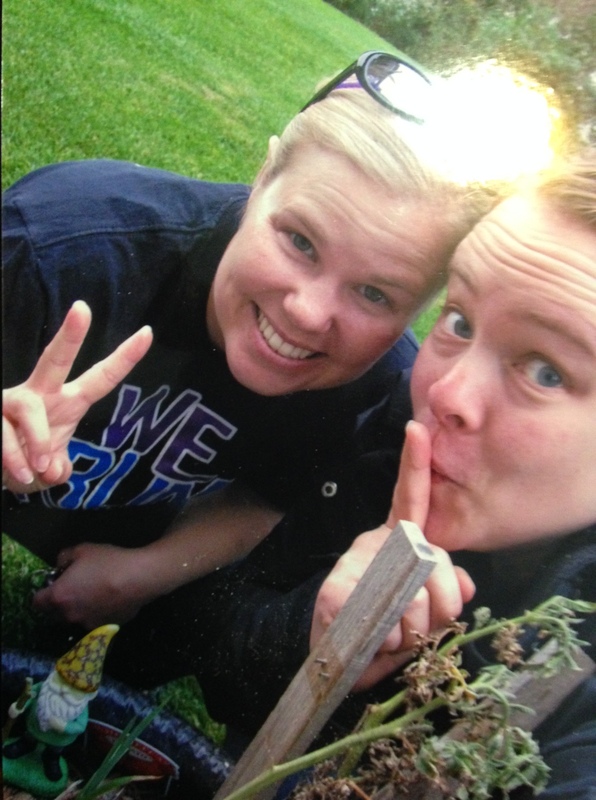 They probably don’t want their identities revealed, and we won’t do that here, but suffice it this way – if you happen to spy these two ladies poking about your homestead, all I can say is grab your gnomes before they do! Grab them post-haste, people, and run! 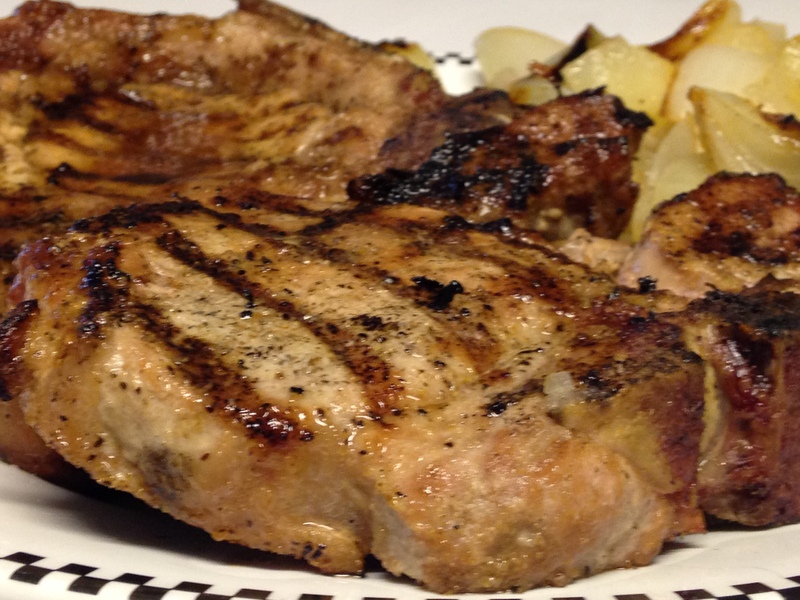 Hickory Smoked Thick-Cut Garlic Chops, sided with Tin Foil Potatoes. Man! The Land of Meat and Potatoes, people. Where good is good, and less is more than enough. Amen. This entry was posted on August 26, 2015 by Patrons of the Pit. It was filed under Uncategorized and was tagged with barbecue, bbq, cooking, fishing, food, foodie, hunting, nature, poetry, pork chops, travel. The best blog ever on my list of culinary adventures! I certainly would be a frequent guest at your table; love every chunk of bbq’d meat showcased. And the recipe…easy to follow and execute. Many thanks for maintaining such a remarkable site. Wow, that was nice to say! Thank you kindly for that! Said from the bottom of my soul! Don’t mention. Pork Rib chops (or rib steaks of the beefy variety) benefit GREATLY from a couple of cuts through the fat cap before grilling to stop them from “cupping” while they cook. That’s a great tip! I’ve noticed pronounced cupping in my chops as of late. Some do it, and some don’t, it seems. I’ll have to try your trick out next time and report on the results! I should have known you were a former gnome-napper. There seems to be an underground clan of you people! Prime Rib of Pork….I think I just wept a little. You pretty much nailed my thoughts exactly! Thanks Kate! Your friend Laurie (from the land down under) mentioned you recently in a response to a post we did on stuffed flounder. We both agreed that you guys reign as the uncontested kings of barbecues and you’ve gone and proved it once again! Well done. Glad to hear that all has returned to normal in your garden and the gnome is back keeping you company pitside. Better get him some warm clothes! Winter officially starts up there right soon! Ah, thank you kindly, John and Mary from Ecuador. We’re just humble pit jockeys who like to eat the meat. I can’t believe I missed your flounder post. How does this happen! Never mind I saw it, just not the comments. I will be happening over there shortly, I do believe. Yes, winter is on the far horizon. No leaves have turned color yet, so, for the mean time I’m pretending its still summer. Thanks for subtly rubbing it in tho, like sun-drenched Ecuadorians ought to I guess. May your pool float go flat! Take care, mate, and blessings to you and Mary! I’m back and what a great post to return to. Now Gnomes may not know a lot about smokin’ and grillin’ but they love to travel. I have one that sits in the garden and he always looks wise and alert. perhaps I should invite him to the next bbq. Thank you, Laurie. Excellent to see you back in the cyber folds again. You’re one of those chaps that I notice when he’s gone, unlike my gnome. So I’m glad you’re back! And likewise, do indeed invite your gnome to your next BBQ. Why not! Thank you PotP, good to be back. It’s nice to be missed. 🙂 I’ll have to dig him out and hose him down first. Haha, that’s a good way to put it. Thank you bbqbastard! Yeah the life of a garden gnome is not all it’s cracked up to be! Thank you kindly! Maybe your gnome and my gnome hooked up and went away together. I’ll have to check when I get home! Take care good people of minersmix! Back when I worked in a photo lab, there was a certain gnome who was gnome-napped for an entire year and got sent all over the world with all kinds of people. It was quite amusing. Wow, now that’s a quality gnome story. Impressive! I had no idea gnome napping was so prominent. But I guess it is! The library that this gnome lived in was owned by a guy who complained about not having enough time to travel like he wanted to. So a friend decided the gnome would go instead and knew people who did world travel for business. Simple is good. Nice chops. I have a gnome-free yard, by the way. I work hard to keep that riff raft out. Thanks Todd. Yeah, some days, simple is just fine by me. It’s fun to get fancy and all, but good food prepared simply definitely has a place on the menu. Hunger is the spice! Ahahahahaaaaaaaaaaaaaaa! Your gnome doesn’t look very worried for someone who got kidnapped! Looks like he enjoyed himself! Your chops are simple but tasty on the other hand rosemary was missing.. Or another herb,like oregano.. My personal taste though. I need more rosemary in my life, you’re right..I agree! I’m growing aherb garden as we speak tho! And yeah, mr gnome I think rather prefers the attention.